On February 8, 1690, during a major blizzard, a band of 114 French soldiers and 96 Sault and Algonquin Indians entered the stockade gates surrounding the tiny village of Schenectady, burned down the village, and massacred, kidnapped, or scared away its residents. The Massacre of 1690 yielded Schenectady’s Tale of the Snowmen at the Gates. This past week, like innumerable cities and towns throughout the nation, the Stockade was invaded by heat and humidity, and hundreds of hunters of Pokemon Go pocket monsters. They came with GPS technology and a brand new app, taking their Pokemon skills and obsessions out into the world, staring at smartphone screens, in search of Shops, Gyms, 151 pocket monsters, and adventure. 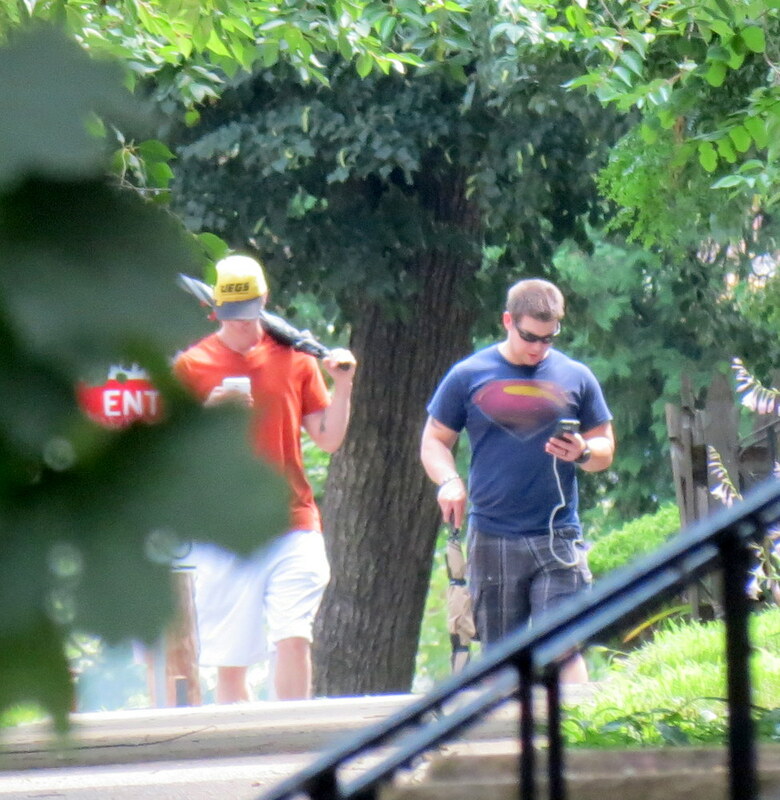 For local news coverage of this international phenomenon, see the Albany Times Union article, “Making connections amid Pokemon Go craze”. Update (Aug. 4, 2016): See “History and Pokemon Intersect in the Stockade” (Schenectady Gazette, by Brett Samuels). 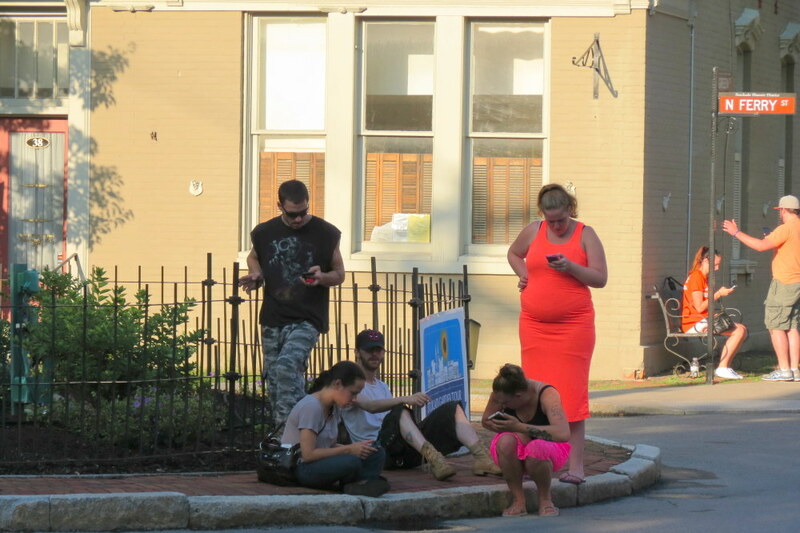 The following Slideshow presents a tiny slice of the Pokemon action taking place all day and long into the night, on the streets of the Stockade Historic District (especially near Lawrence Circle and Arthur’s Market and the Historical Society), where pedestrians other than dog-walkers are usually a scarce commodity. No one knows how long the Pokemon Go fad will last. Most of us were pleased to see friendly, well-mannered hoards of youth swarming our streets, even if we scratched our heads over just what was happening and why Pokemon fever became an instant international epidemic. This weekend, the Pokemon armies will be vying with Garden Tour guests and Erie Canalway bicyclists for space on our streets. 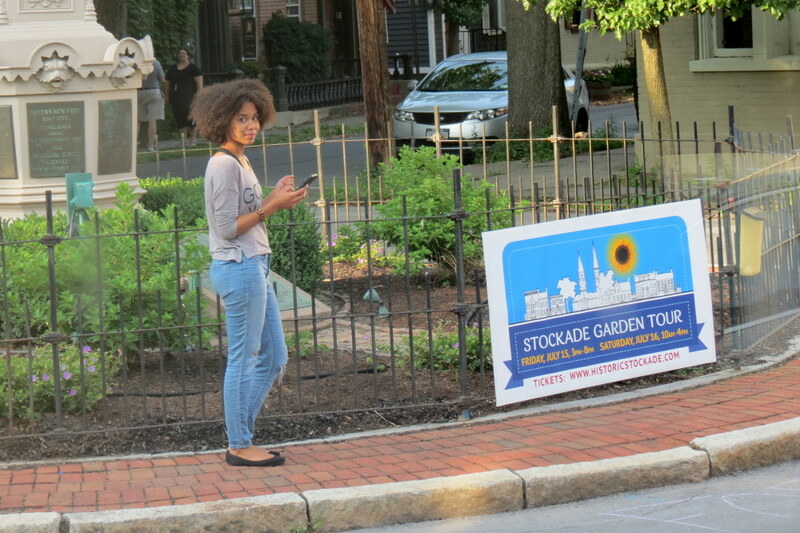 A bit of patience, good manners, and good attitudes should add up to an especially interesting and enjoyable summer weekend in the Stockade. p.s. Despite staring at their screens, and not watching their steps, I saw no bloody knees, or even errant stumbling. I guess youth has better balance than their elders traversing our historic sidewalks.